Part of the inspiration to visit Mt Veeder, in addition to it being one of the last remaining appellations not yet targeted in our focused visits, was our longstanding enjoyment of and appreciation for Mt Veeder Cabernet Sauvignon from Robert Craig. 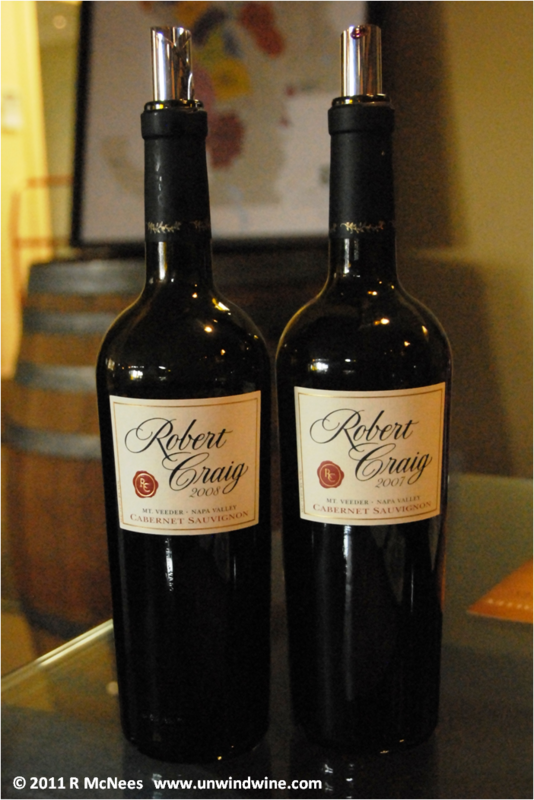 We first met Robert and tasted these wines back at our first visit to Robert Craig during our Napa Valley Wine Experience in 1996, and then again at our Robert Craig featured producer wine dinners in Napa Wine Experience 1998, and again in 1999. Indeed, we have a assembled a vertical collection of this wine dating back to the inaugural release 1993 vintage. We tasted releases of this wine with Robert and his crew at the Robert Craig Howell Mountain Harvest Party '09 and during other visits such as our 2008 Robert Craig Vineyards and Winery visit up on Howell Mountain. Needless to say, we're long time fans of Bob and the Craig team and their 'artwork'. We have heard Robert say on more than one occasion that his favorite variation of cabernet releases is his Mt Veeder selection. 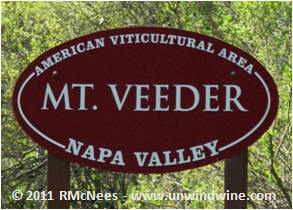 Bob's roots are clearly embedded in Mt Veeder where he work for years learning and refining his craft. Hence it was only fitting that our visit to Mt Veeder was only complete when we revisited Robert Craig to taste the benchmark standard bearer for Mt Veeder Appellation Cabernet Sauvignon. 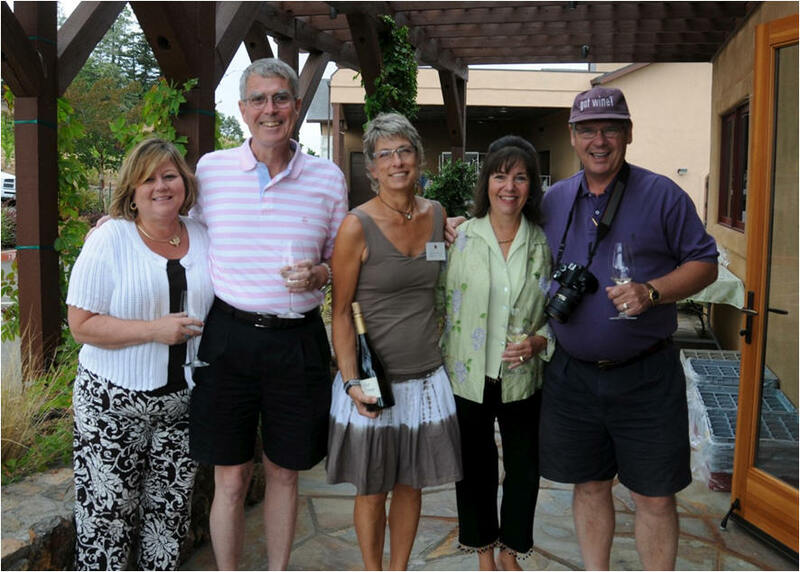 We (at/from left Beth & Bill, Rachel, Linda and I) stopped in at the Robert Craig tasting room near downtown Napa to say hello and recalibrate our tasting palate with the reference standard. We were warmly greeted by Rachel and the staff. We appreciate their hospitality and for affording us an impromptu focused tasting of just Mt Veeder cabs on short notice. It was the fitting finale to our trip. Thank you! Indeed, as I write/type this, our allocation shipments of the '08 vintage releases arrived just this week. Big full bodied, firm forward black fruits, black berry, black cherry, spice, layer of dark chocolate rich, hint of tobacco and cedar on a full firm lingering tannin finish. Perhaps the richest and most complex version yet. RM 93 points. Black berry and black cherry fruit flavors, layer of black currant, hint of leather, mocha and cassis on a nicely integrated fine-grained tannin finish. RM 91 points. 85% Cabernet Sauvignon, 12% Merlot, 3% Malbec. Not only do we continue to enjoy each subsequent release of this wine, but they are getting better with time. We continue to be rewarded by the longevity and ageworthiness of these wines. My tasting notes journal of earlier tasting reviews are posted at www.unwindwine.com.